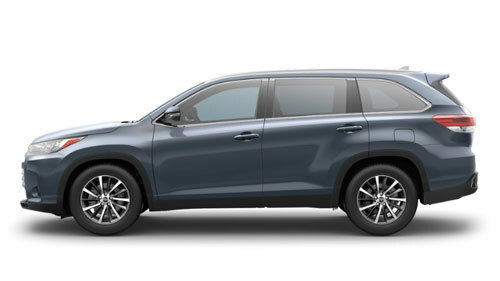 Gosch Toyota in Hemet, California is eager to introduce all motorists in the area to the sleek, competitively priced 2019 Toyota Highlander that is now available! As we're conveniently located near Menifee, we encourage you to drop by for a thrilling Highlander test drive and to talk to our on-site finance department about the loan packages that are available to you if you're interested in financing options. Our inventory can be explored right here on our website, so don't hesitate to get a feel for all the Highlander trim models - each one more advanced than the last. Plus, when you use our online service, make sure you take advantage of the available Trade-In calculator. Drivers in the Moreno Valley area can take advantage this year of all the compelling features that the new 2019 Toyota Highlander SUV comes with. First off, the available 3.5L V6 direct-injection engine has been designed to give the new Highlander the perfect amount of power and control. Then, take note of the available Dynamic Torque-Control All Wheel Drive that has been designed to embrace the road at all times; even in horrible weather. Finally, drivers will be able to enjoy the big adventures with the Toyota Highlander available max towing rating of up to 5,000 pounds. When you shop or purchase with us at Gosch Toyota, make sure to get in touch with our helpful and friendly sales team. Our sale associates are trained to help you in every aspect of the car buying process. Visit with them, and they can answer any questions you may have about the new 2019 Toyota Highlander SUV. Make sure you ask our sales team about the Highlander’s available Bird’s Eye View Camera that has been designed by Toyota Engineers to help you see nearby objects and to park in and out of the smallest of spaces. Don't miss your chance to finance a Toyota that has such advanced technology and safety features while catering to your comfort needs, secure a 2019 Toyota Highlander from Gosch Toyota today! We invite all shoppers in the Hemet, CA area to browse our affordable inventory on-site today or online right now from the comfort of your home. Our professional team looks forward to reviewing all that the Highlander has to offer!